It’s been a forgettable 2018 football World Cup for the set of top eight seeds this far. Germany faltered. Argentina missed a penalty. Brazil missed a step. France just about escaped. The first round of matches has left fancied sides with considerable work to do to qualify for the knockout stage. Numbers from the last four tournaments show that while the odds against qualifying increase for teams that stutter at the first hurdle, all is still not lost for them. This stutter among the top eight seeds on football’s grandest stage is of a degree unmatched this century. Only two of the eight teams, France and Belgium, have opened with a win in the 2018 tournament. This is the lowest between 2002 and 2018—a period of study that covers four completed world cups, which we have taken to capture the 32-team format and continuity in team strength. The next lowest in this period was four wins, in 2010. The silver lining for the top-eight seeds is that twice as many corresponding entries have gone to the draw column than the loss column (see chart 3). As many as four teams drew their first group match, which is again a record in this study period, and is perhaps a statement on the narrowing gap in the football order and the unpredictable nature of a format that is essentially a small series of one-off matches (see chart 1). For a seeded team, winning the first match sets it up nicely. 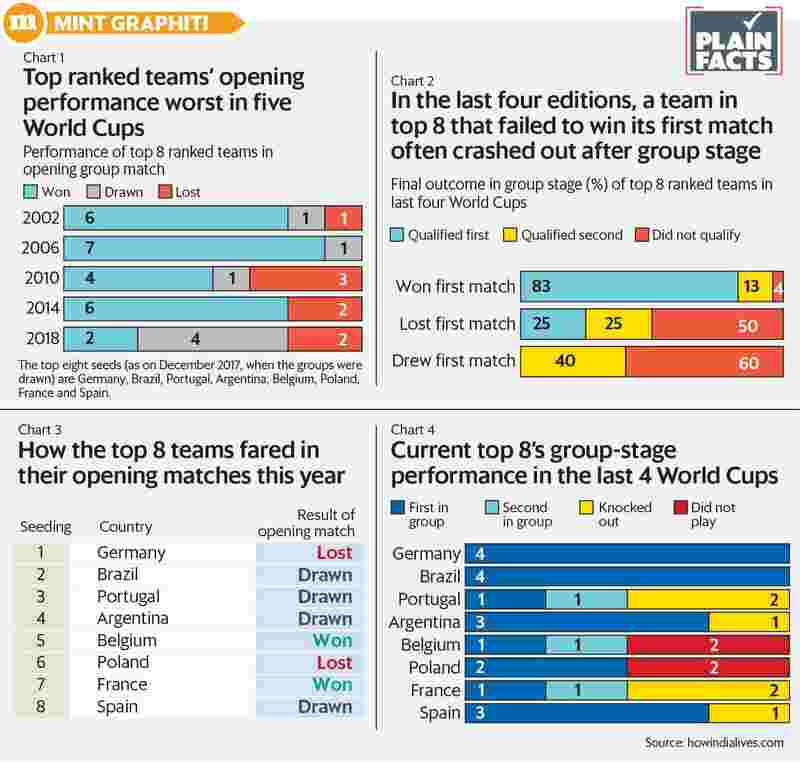 In the last four editions, 83% of the top-eight seeded teams that won their first match finished first in their group and another 13% finished second. In other words, 96% of teams winning their first match moved to the knockout stage. Only once did a top-eight seeded team win its first match and fail to progress: Argentina in 2002. In contrast, in the last four editions, 50% of the top-eight seeds that lost their first match and 60% of the top-eight seeds that drew their first match did not progress to the knockout stage. Even when they do progress, most of the time they progress as the second-placed team in the group and not the first-placed (see chart 2). Finishing second has ramifications for some teams more than others. For Germany—reigning champions and a model of metronomic consistency—the setback to Mexico is greater because of its schedule and the draw. Its next match is against Sweden, a potentially stronger side than Mexico, rather than South Korea. If Germany lose, its fate is probably sealed. If it draws, it will need favours from others in the group to progress. And if it progresses with a second-placed finish, and Brazil finish first in its group, the two titans that squared off in a semi-final in 2014 will clash in the round of 16. In the last four editions, Germany and Brazil have progressed to the round of 16 every single time. Similarly, Argentina have progressed on three of the four occasions (see chart 4). They have records and reputations to not just protect, but also enhance. But recent World Cup history also carries the remains of teams that stuttered at the first step, and failed to pull off an escape act. In 2010, France and Italy drew their respective first matches. In 2002, France came into the tournament as the title holder, but lost its first match to Senegal 1-0. In 2014, Spain was demolished 5-1 by Netherlands. Will World Cup 2018 add to this list?